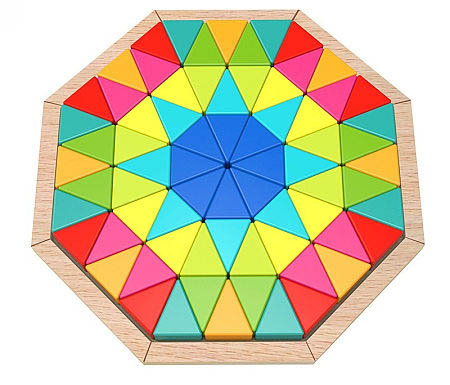 Wooden Mosaic Octagon Puzzle is an explosion of 72 beautifully colourful smooth triangles contained in a Beech wood octagon shaped tray. This puzzle can be arranged in or out of the tray into a myriad of different designs. Your imagination is really the limit here. The mosaic puzzle is beautifully finished strong Beech wood and comes in a strong cardboard box for easy storage. We like this because: "Such beautiful colours and so many possiblities. "